As you may or may not have heard, in a few weeks I will be moving out with my boyfriend. As such I have spent a LOT of time surfing the internet and looking at furniture for our new place. That is when I stumbled across the beautiful French Bedroom Companies website. I am a massive fan of French style furniture, however unfortunately for me, my boyfriend is not. 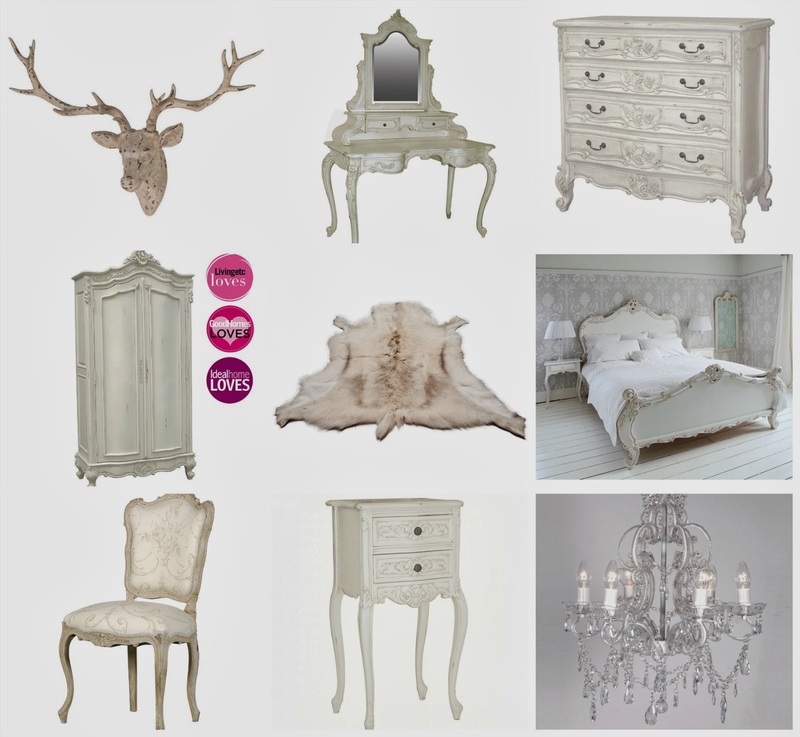 SO to satisfy my urge for a completely french style bedroom, I thought I would make a wishlist! Everything featured below is all from the same website, and you should be able to find all of it there! As you may be able to tell from the photo, I am a massive fan of white. I love how pretty white furniture can look, and a bedroom always looks so modern with white furniture and a pop of colour. With my favourite colour being blue, I think it would suit perfectly with this furniture. My favourite item by far of this list has to be the dressing table, it's just so grand, and would look amazing in any room. I am also a big fan of the faux deer wall hanging, I've been looking at these everywhere, and I might just end up buying one and giving my boyfriend no choice but to hang it, they are too cute! I also never thought I'd like a chandelier, but this one here seems to work with everything else I picked out, and I certainly wouldn't be unhappy to see this hanging in my bedroom. Maybe one day I'll get my wish to have a fully french style bedroom, we'll just have to see! I love it all ! the stag head is beautiful i have a slight obsession with them !